Ask kitchen and bathroom remodeling contractors what home improvement increases the value of your home more—the kitchen or bath–and you will get the same answer: the kitchen. Yet if you want our honest opinion, increasing the resale value of your home should be a secondary consideration. Your enjoyment of your remodeled kitchen should come first. Among kitchen and bathroom remodeling contractors, very few have actually owned and operated their own restaurant. Before Ken Moniz started Moniz Home Improvement, he was the owner of Seafood Sam’s in Harwichport. So, our expertise extends beyond just a creating a kitchen remodel that looks great. Ken knows from first-hand experience how to create a kitchen remodel that functions smoothly with one or more cooks in the kitchen. Do you need complete kitchen remodel? How you currently use your kitchen? Do you cook for big crowds or just you and your family? Do you ever entertain and foresee the kitchen as part of a place where guests mingle (let’s be honest, everybody always ends up in the kitchen)? What’s the status of your appliances? Are there any you like or do you want to start anew? What are your preferences when it comes to counter tops, back splashes and cabinets? During that conversation, we will literally and figuratively talk about everything, including the kitchen sink (or sinks). We also do something quite rare these days: we listen closely to completely understand what you’re looking for. Of course, we discuss budget, too. Some people have their dream kitchen in mind. We want to make that dream come true. Sometimes the budget might dictate a different course of action. We can work within that budget and create the dream kitchen that fits that budget. Based on our discussion, we will work up an estimate. That could include more than one option if you are trying to decide between a high end and lower end alternative. Once you decide, we can then provide a design so you can see what your dream kitchen will look like. Licensed and insured, Moniz Home Improvement can take your kitchen remodel project from soup to nuts, handling every detail. That includes working with the local municipalities for the work permits to ensure we stay on schedule. If you are not a year-round resident and can’t be on-site, you can rest assured that we will treat your home with kid gloves. 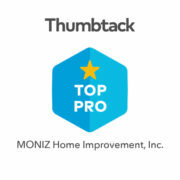 We encourage you to contact Moniz Home Improvement customer who also were not year-round residents and will gladly provide you those references. We want you to be comfortable with us working in your home. Your dream kitchen is just a phone call away. Give us a call to start the conversation.